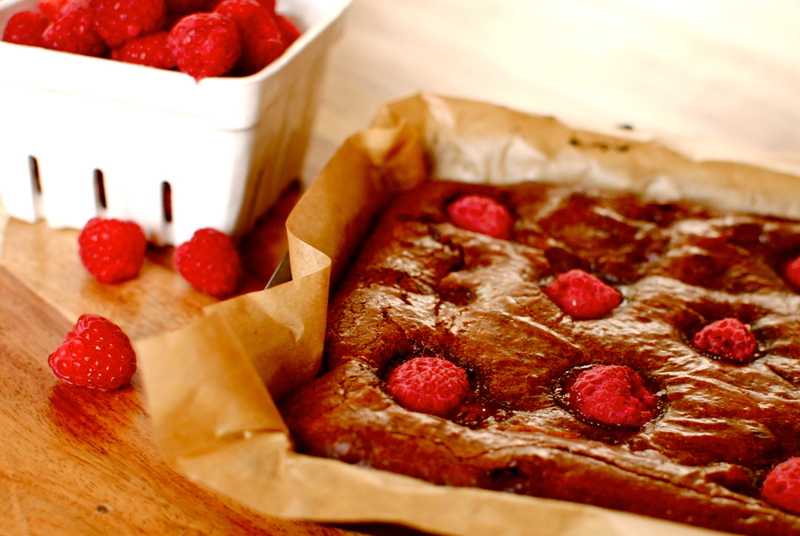 Squidgy Raspberry Brownies – a gluten-free treat! Does the world really need another brownie recipe? Do you and I really need another take on one of Boston’s* finest contributions to the culinary arts? Yet more words and ingredients leading us on a crumb trail to chocolate bliss? You probably have a couple of brownie recipes that you switch between, depending on whether you want something quick (that’ll be a cocoa brownie), or something more luxe and time-consuming (anything involving multiple ingredient layers; see my friend Heather’s ‘infamous slutty brownie‘). Most cookbooks – even healthy ones – will have a brownie recipe. So, the answer to my question is probably ‘no’. But, I think I might have a slightly different take with this rather melt-in the-mouth version. And it is incredibly simple, too. As usual, I did a little experimenting first. I am not a gluten-avoiding cook particularly, but I do like to dabble in the slightly mysterious – to me – world of gluten-free baking. I think that most of us could do with having less wheat in our diet, but without saying ‘no’ to things that give pleasure, like cakes, brownies and bread. Speaking of bread, my g-f breads are a bit of a disaster (they will forever remain unpublished), but I am having increasing success with the temperamental art of the wheat-free bake. Especially with brown rice flour. My first batch of gluten-free brownies went well – nicely risen, slight crackle on the outside, sigh-ingly soft on the inside. This respectable pan of brownies – which lasted all of one day in our house – gave me the confidence to make it for others. However, with ego riding high, my second batch was done in a hurry while making four other things for my nutrition classes. In my haste, and with the kitchen teetering with barely balanced pans and trays, I left out the almond meal. Actually this was not the disaster that I thought it might be, although when I peeped in on its baking I was quite alarmed with the bubbling. Brownies do not bubble when they bake. Cheesey gratins under a grill, yes. Brownies, no. I quickly surmised that I had left out the meal. With a bit of muttering and grumbling I carried on, expecting to be throwing the by-now volcanic mess out. But when it cooled and I gave it a nibble, it was actually very nice. Not pretty, a bit pock-marked and rutted from the damned bubbling, but gorgeous flavour and soft texture. I rustled up another, prettier, batch and all was fine. I stashed the duff one in the freezer, and we have since had a few slices. I even had one with a friend who seemed to genuinely like it (thanks for being my guinea pig, Lynn). So, if you are prone to ineffective multi-tasking like I am, and you accidentally leave out the almond meal – which is there to provide some structure-aiding protein – it is not a complete disaster. So, probably the answer is still no: we don’t need another brownie recipe. But after all that palaver I am darn well going to give you another one anyway! Hope you like it, despite it’s difficult history. *The history of the brownie is disputed by some. It may even be a Yankee tweak of the Scottish ‘broonie’, which is made with oats and no chocolate (more of a blondie then), or even the Scottish chocolate scone. Both Scottish recipes were published before Fannie Merritt Farmer’s Boston brownie, from her 1906 cookbook, Boston Cooking School Cook Book. I like to think the first brownie was a chocolate cake gone wrong – but oh so right. Have you had any recent culinary disasters that you would like to confess? Did you redeem it, or did it get shoved in the bin before anyone could see (plenty of mine have been the latter)? And, can there ever be too many brownie recipes? The title says it all – squidgy. If you like cakey brownies, look away now, ‘cause this is squidgy to the max, my friend. 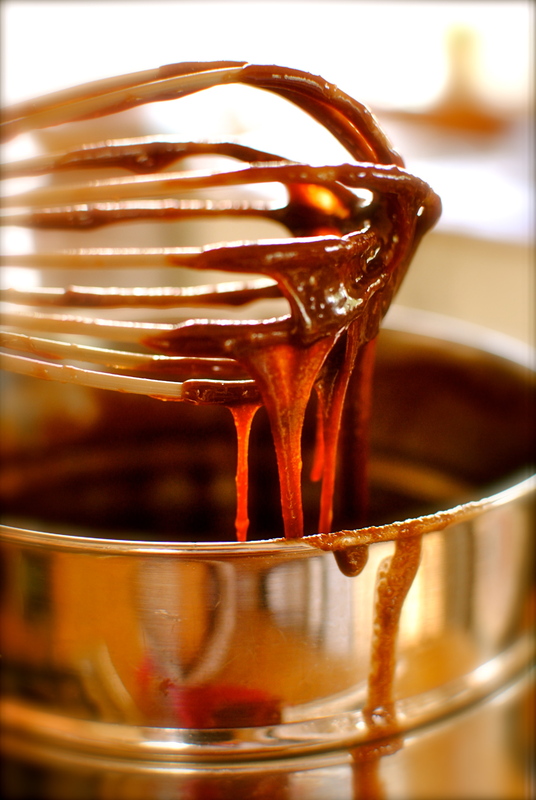 Melt together the chocolate, sugar of choice, butter and rapeseed oil over a double boiler, and mix well. Let cool a bit before beating each egg in, one at a time, then stir in the salt. The mix will be lusciously glossy. Stop licking the spoon. 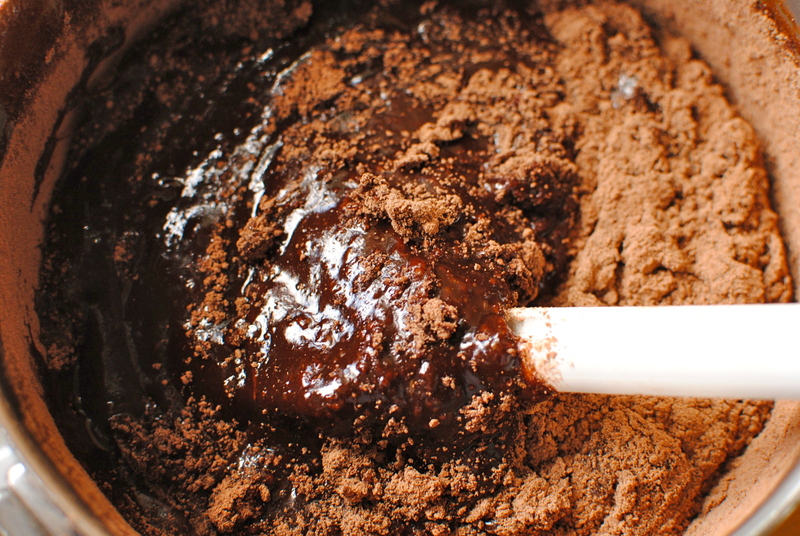 Sift in the flour, almond meal and cocoa powder, folding the dry ingredients in with a large metal spoon. When it looks ‘batterish’, fold in half of the raspberries. Pour the brownie mix into a parchment paper-lined 20cm x 30cm pan (sometimes called a ‘brownie pan’), top with the remaining berries, and bake at 180C/350F for round about 30 minutes. Every oven is different, but what you want is a crackly top and a little brownie sticking to an inserted skewer – but not wet or uncooked in any way. Let the brownies cool in the pan on a wire rack before lifting them out by the edges of the paper. These are great warm as a gooey dessert with some ice cream, but to eat with your fingers I recommend chilling them first. They also freeze very well as individual slices. Makes 12-16 slices, depending on greed and need. Public Service Announcement: here’s a trick for crumb-free cutting – use a plastic knife. Just an ordinary picnic or fast food knife will do (do fast food places do knives??). I keep one in the cutlery drawer for any cake or bar cutting duties, and heaven forgive anyone who dares move it, because I sure won’t. You will thank me for this top tip. It really works. You are too funny Savvy Sister! It was very hard not to lick the pan & spatula clean, that’s for sure. That’s what kids are for. How I so wished I had one of your squidgy treats right now to go with my first cup of coffee of the day! Although I have dabbled in gluten-free brownie making, my go to recipe is Bob’s Red Mill gluten-free brownie mix (it is so moist!) to which I add either dark chocolate chips or white chocolate chips for extra squidgyness. I can’t wait to try your recipe with either the rice flour or sorghum flour which is one of my gluten-free baking staples. Love the brownie history lesson too-fun! ohh dear i am in need of THAT brownie!!! and NO there can never be enough brownie recipes. the gluten free version surely is a big plus too!!! 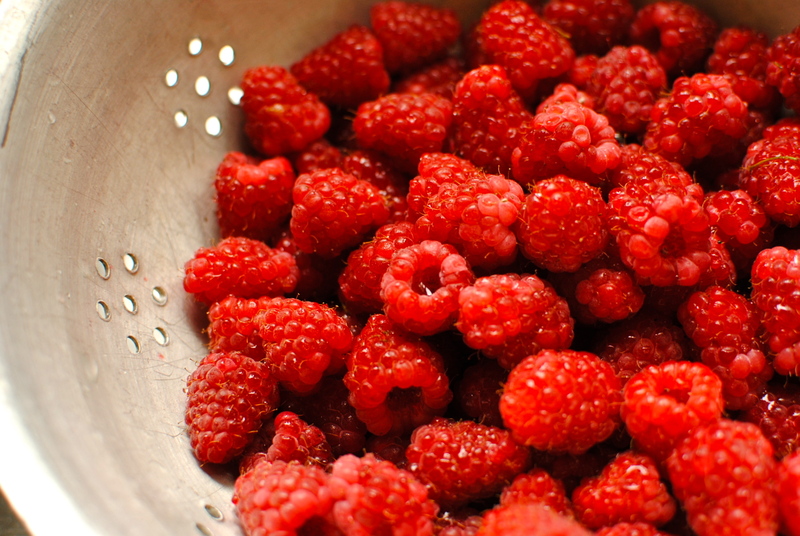 the raspberries are the perfect addition, I would add some extra goji berries for a little chewy surprise! Ooh goji berries. Funnily enough I did actually eye them up for adding in. So go for it girl, and tell me how they are for you. I am concerned about the oven timing as mine is a bit fast, and I want these to be perfect for anyone who tries them. Btw, I have recently acquired some freeze-dried raspberries (like in the popular diet cereal, which shall remain nameless) so might chuck them in next time. yum! squidgy is good! and i am going to try out the whole plastic knife recommendation next time i make brownies! It’s a top tip & cheap too 😀 I can’t remember where I saw it but I am glad I did see it. That is positively cruel to put up scrumptious images like that on the web on an ordinary Tuesday afternoon! They look super- delish, I shall try, thank you. I don’t use any flour (lots of whipped egg white though) in my brownies and they are rather good too but I guess yours will probs keep a teenager more satisfied for longer which is always a big bonus around here so I shall defo try. Thanks! I actually had your eldest in mind when making these (with Pure though), so I hope you do get to try them & give your feedback. As for cruelty, I find that everyday with all the lush food blogs I subscribe to. Pure torture as I bookmark away. Hope the shop set-up has gone well! These look delicious! 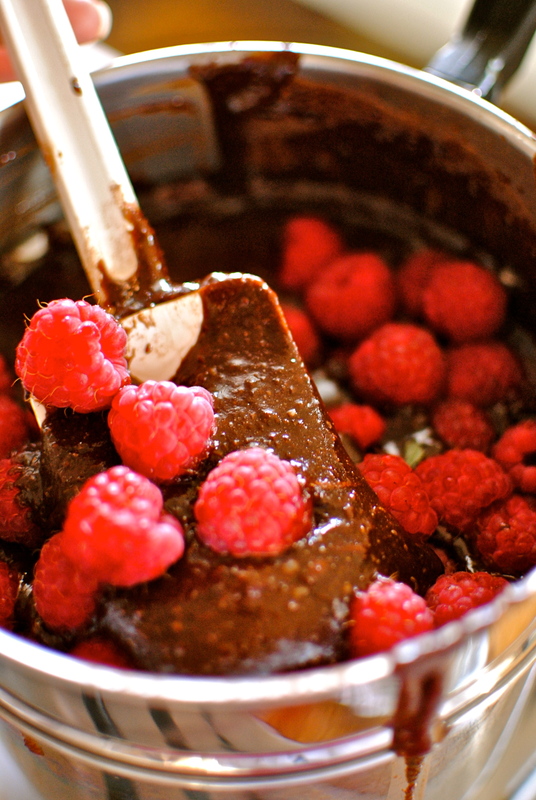 Chocolate+Raspberry is definitely my cup of tea. I will have to try these! Oh I am always ready to test another brownie recipe! And if it is a healthier version, what could be better than that? A scrumptious post! It is a bit healthier, but it is still a brownie ;D So, I take it there are not enough brownie recipes in the world then? The world can always use another brownie recipe! P.s I’ve had too many kitchen disasters to even count… Luckily I have a brother who’ll eat anything! I wish I had a brother. I hear they are human hoovers when it comes to food! Your slutty brownie is fun, and well, slutty, so it is good counterpoint to this one & I wanted to include it. Room for all kinds of interpretations. Ah yes, I know what it’s like to be multi-tasking and forget something in a recipe! Sometimes though, that’s how the best recipes are born…and it definitely sounds like the brownies were delicious even without the almond meal. I love the texture of these beauties! Thanks Faith. You are right. For every duffer of a recipe caused by something missing or too much of something, there are more ones where happy accidents are made. I think burning things when I get distracted by door or phone is probably my most common one. And nothing rescues that! 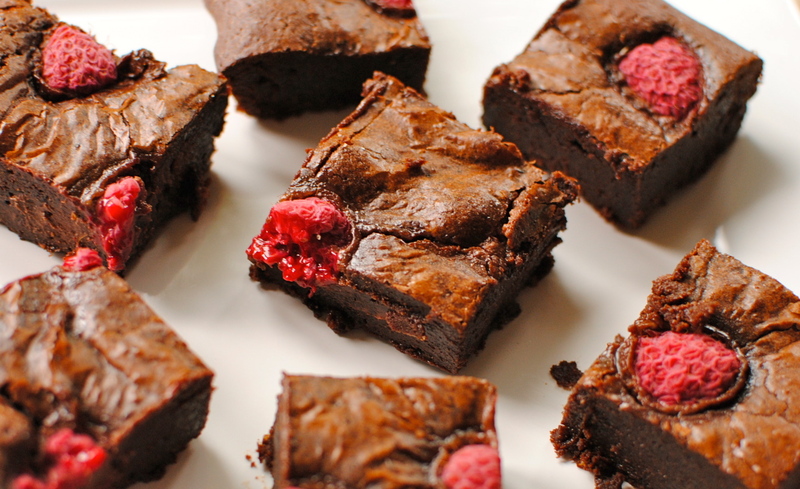 I love raspberries in brownies, they tend to add a tangy taste and a lovely flavor added. I have tried bloodies with raspberries and really work fine. My dear, as a gal in the Southern part of the US, we don’t have a CLUE what squidgy means…you should have a link to Wikipedia for us “over here”, so we can translate…LOL!!! I just know these look delish!! Sorry about that. I’m Southern too! Squidgy is a delightful British word that encompasses squishy but with more pleasant, foodie overtones. It was also the nickname that lover James Gillespie had for Princess Diana, a la ‘Squidgygate'(secret recording of a private phone call). I prefer squidgy as a description of soft and squishy brownies, not people! 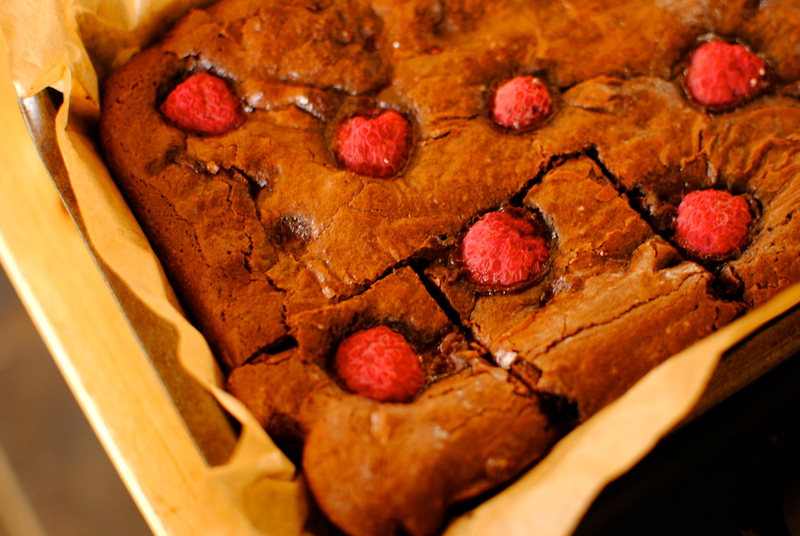 Gluten or no gluten, squidgy sounds like a very good thing for a brownie to be – and you won me over with the raspberries. Distaster averted! 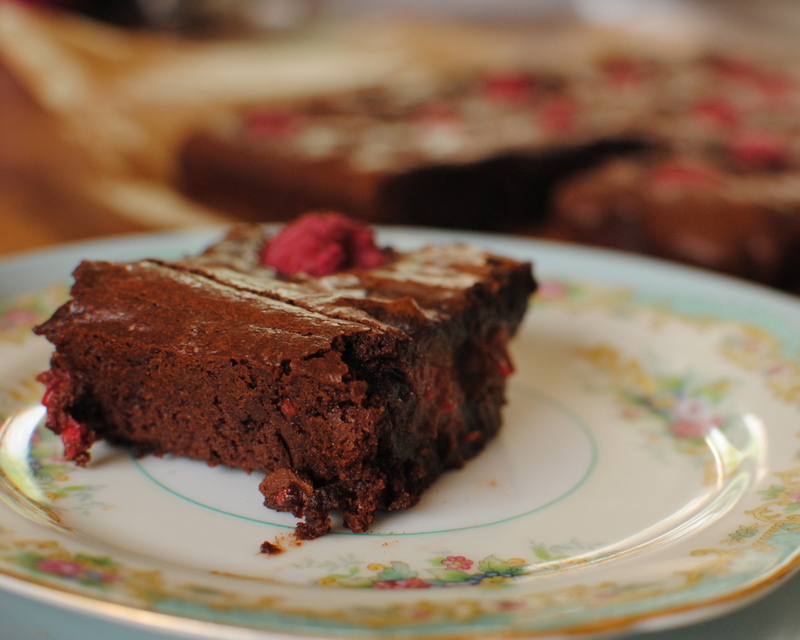 Maybe the world doesn’t need another brownie recipe… but we DO need a first squidgy recipe for sure!! And when gluten free and squidgy combine… the world is rocked in a great way. thanks Skylor. I might just have the blogging world’s first squidgy gluten free brownie so I am happy about that. 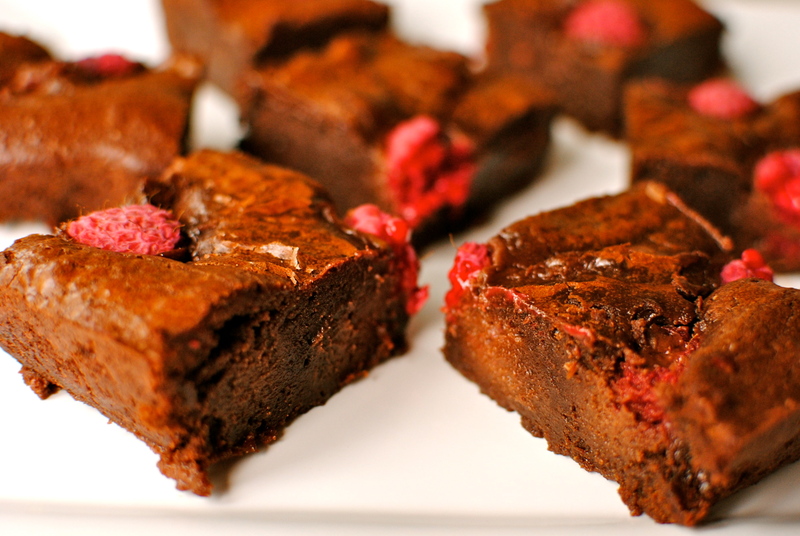 Chocolate and Raspberries is a match made in heaven, how could it possibly go wrong? Love your brownie recipe. 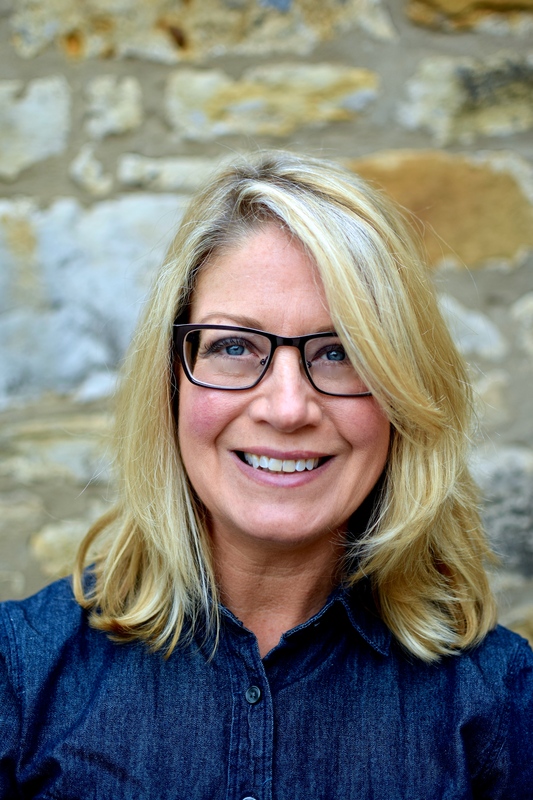 Disasters…well I have had a few, my most recent post features my less than perfect demonstration of a pineapple slicer which seems to have everyone in stitches! You are too funny, Miss Janice. I love that you have shared your semi-disaster (not a disaster really though). At least YOU didn’t need stitches, m’dear. This is such a beautiful recipe, the deliciousness of it just oozes from your photographs. I like using almond in cakes too as gives a great texture and softness to it. That’s very sweet of you to say so but you I should have got you to do the photos – yours are always so gorg!